Debbie Reynolds shared the photo of her Oyster Pot Pie with Southwest Cornbread Crust with the Oyster Obsession Facebook group and had more than 80 likes in a day. We had to have the recipe! 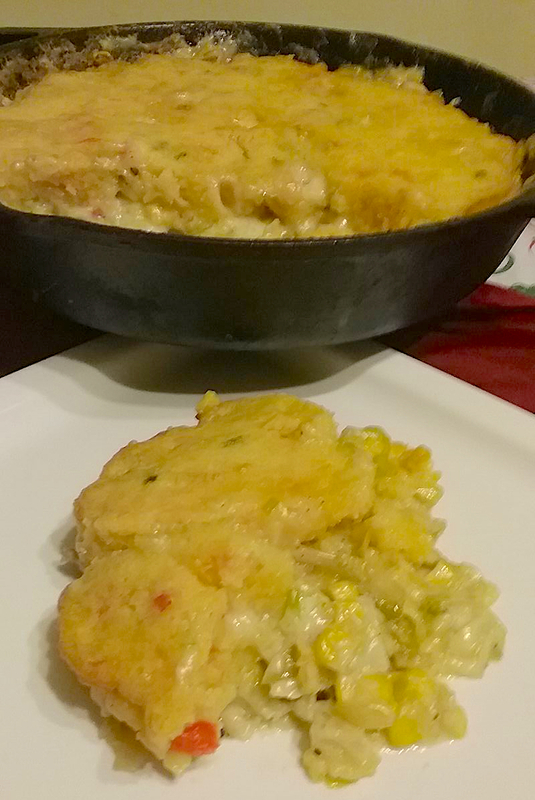 I love the idea of the creamed corn with hot and mild peppers in the sweet cornmeal crust. At first I thought, “No way” on the sugar, but see how it would complement the super-savory oyster pie filling. And what a filling. Leeks, garlic, and shallot with bacon, thyme and white wine blend with heavy cream, oyster liquor and a pint of oysters. In a large bowl mix the ingredients for crust and set aside. Heat a cast iron pan over medium heat and cook bacon until crisp. Remove bacon to a small bowl reserving bacon fat. Add the butter to the pan and stir until melted. Turn heat to low. Add leeks, shallots and potatoes and continue cooking till soft and almost caramelized, 10 to 15 minutes. Add garlic and cook 1 minute. Add wine and oyster liquor cook another minute. Sprinkle the flour over mixture and stir until well blended. Add oysters, bacon and thyme then slowly add chicken stock, heavy cream then stir until well blended and continue to cook until mixture is bubbly and thick. Remove from heat, season with salt and pepper to taste. Allow to sit for 5 minutes. Smooth mixture with back of spoon. Gently pour cornbread mixture over the filling and place pan in oven and bake for 20 minutes. Debbie Reynolds is also responsible for Oysters “Balotelli” with Crispy Pancetta and Spinach. The recipe should have been named “Oysters Debbie.” she sent her favorite ingredients to Mario Batali’s ‪#‎TakingRequests‬ and he came up with this yummy baked oyster.